Leaving aside the matter of ascertaining the difference between collecting “primary language of patient” and “patient language needs,” these highly encouraging results led me to seek details in the source report. Having recently done extensive research for my own presentation on the status of language services in healthcare for the 2014 WASCLA Summit, the HPoE findings seemed even more amazing. What I found in the report itself , which did conclude that more needs to be done to achieve equity of care in the broader sense, was that some basic background and research points seemed not to have been included or were too limited in scope to be meaningful. For example, the report did not include the list of hospitals which had participated in the survey, nor how the recent cohort compares to the 2011 and 2009 participant groups. There was no discussion of the statistical validity of the response rate of 1109 hospitals (~19% of all 5922 AHA member hospitals invited to participate), nor how representative the response sample is for hospitals nationwide. 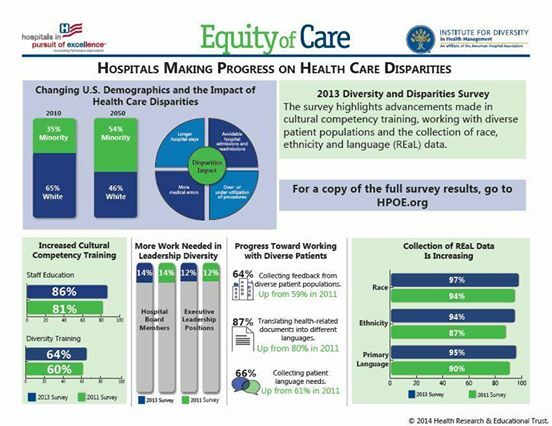 For example, while the study noted that all data was self-reported, there was no mention of the possibility that only hospitals which have disparities reduction initiatives chose to participate. I am pursuing the actual data used for the study, and hope to have information to share soon.